As promised we have gotten back the results of the thermal modeling from our mechanical engineers, which was a simulation designed to test our energy conservation and generation assumptions. The great news is that Jim and his team have designed a very efficient "high performance envelope", basically put roofs, ceilings, walls, windows, doors, external floors and soffits are components of the building "envelope". A high performance envelope means that each component is designed to minimize the transfer of thermal energy which in turn creates an energy efficient or "tight" building. That is very important since we first want to conserve or minimize the amount of heating and cooling required to make the building comfortable which in turn reduces the amount of energy that we need produce to cover those requirements, while meeting our objective of NET ZERO. But in order to provide addition energy savings we are investigating a new technology for the interior walls and ceilings in the house, called "Phase-Change Wallboard". Phase-change materials (PCMs), usually a paraffin that can be embedded in gypsum (wall) board, form a class of building material that functions as a storage medium. Materials undergoing a phase change (freezing, melting, condensing, or boiling) store and release large amounts of heat with small changes in temperature. PCMs offer an order of magnitude increase in heat capacity, and for pure substances they discharge their heat with almost no change in temperature. This is extremely cool (in the great sense, not the cold sense) because it allows the thermal storage of our building to become part of the building's structure, permitting substantial energy storage without changing the temperature of the building. Because the heat is stored within the building where the loads occur rather than externally, additional fans or other air movement is not required. The real challenge came when we looked at the other side of this coin, energy generation. As you may remember from our December 29th post, the roof area was redesigned to accommodate the solar PV array, providing about 850 square feet of usable space. The simulation indicates on a conservative basis that while the area on the roof would be sufficient to power the main building, it would not provide the necessary KW's to provide any heating or cooling for the garages and workshop, any equipment usage (i.e. power tools) or electric vehicle charging stations. So it's back to the drawing board for us to find about a 25% increase in renewable power generation. Since the heating/cooling and power generation are joined at the hip, we needed to revisit the entire process to get those gains that we need to get to NET ZERO. So this morning we met with our team of mechanical engineers Imtiaz Mulla and David Goldstein of Plus Group Consulting Engineering to revisit our current plans. What a great education I got today. 1. Re-design roof to accommodate 25% more PV panels. 2. Re-design the entire building, to create additional higher elevation roof space, much like "Option 1", in our original designs. 4. Evaluate the addition of a geothermal heating system to reduce the heat generation and therefore the load on the solar output. 5. 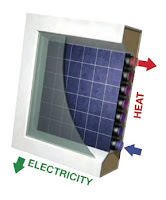 Evaluate other heat collection options to reduce the heat generation and therefore the load on the solar output. Option 5: As the discussion progressed it became apparent that the application of some new technology, could potentially solve our problem, while adhering to my "keep it simple" mantra. - YES! So it was decided that we would investigate a different HVAC system, one based on using the sun to heat water through coils, rather than the original plan of using the south facing thermal solar wall to generate warm air that would be fed directly to the building ventilation system. Enter a new technology, Hybrid Solar Panels or PVT's. PVT's make more effective use of valuable solar roof space. This ‘technological convergence’ effectively more than doubles the per square foot solar power output of PV alone. This is accomplished by passing water under the PV producing hot water as a byproduct, in effect, a solar co-generation process. We then can store that hot water for use in the heating/cooling system. Another benefit leverages the fact that PV solar panels grow less efficient as they get hotter, the water passing through the panel cools the underside of the PV panel therefore lifting effective output. For more information I encourage you to read a very good executive summary on this technology, it's pros & cons and challenges from the PVT Form, sponsored by the European Union. Finally under this new scenario we would eliminate the heat pump and cooling compressors originally specified and replace them with a much more energy efficient system using a new device called an "Absorption Chiller". With this device, it is now possible to cheaply produce cold from warm temperature flow. Using solar generated heat this is more environmentally friendly and cheaper to operate than conventional compression chillers, in fact there is no freon or alternative refrigerants. This is a viable option for generating cold from heat supplied from the Hybrid Solar Panels and with applying very little electrical energy. Another positive from my perspective is that it contains so few moving parts susceptible to wear and tear, maintenance of the unit is very limited. So Imtiaz and David are off working through the details and will re-run our thermal energy model to see if this combination of technology and engineering will help us reach our goals.